Munich High End Show 2016 in pictures | What Hi-Fi? In the weeks leading up to the High End Show, we were made aware of some big new launches, such as Cyrus' One amplifier, a new range of Dynaudio speakers and several products to celebrate Elac's 90th birthday. We knew we'd see some pretty unusual looking turntables at the High End Show, but nothing quite prepared us for the Acoustic Signature Invictus. It costs €105,000 and has four - yes, four! - tonearms. Arcam's rHead headphone amplifier made its first appearance at the show. It uses Class A amplification and will cost £395 when released. Astell & Kern's new AK300 hi-res player should cost around £700. Audio Technica had a decorated room to launch its new AT-ART1000 moving coil cartridge. The Avantgarde Acoustic Uno XD speakers drew in the crowds. One of the biggest launches came from B&W, in the form of its new flagship 800 D3 Diamond series speaker, yours for just £22,500 a pair. Burmester had a few new product launches at the show, including the 159 Mono Power Amplifier and the mammoth C500 loudspeakers. Canton brought its Reference K series loudspeakers to Munich. Another big launch at the show came from Cyrus as it unveiled its brand new One amplifier. It combines a phono stage, aptX Bluetooth and headphone amp into one affordable package. Dan D'Agostino's room played host to a number of attractive high-end products, including the impressive Momentum Phonostage. Dynaudio launched a revised range of Contour speakers, comprising a bookshelf and two floorstanding pairs. A centre channel is due to follow. One of the wackier exhibits at the show was this Dynaudio speaker made of Lego. Final Audio unveiled the F7200 earphones, which are claimed to be the world's smallest. They weigh 2g and come with a choice of eight different ear tips. Focal launched a new Sopra 3 loudspeaker and added surrounds, centre speaker and sub to the range to cater for surround sound enthusiasts. It's always good to see Grado at the show. Here are the company's RS1e headphones and RA1 headphone amplifier, which you won't be able to find in the UK. KEF's room was dominated by a range of good-looking speakers, including the Muo wireless speaker in new colours. Mark Levinson launched its new No.519 audio streamer at the show. The MoFi Studio Deck, made by Chicago record label Mobile Fidelity Sound Lab, has a rather minimalist design. NAD launched two new components to its Master Series in Munich. They comprise a high-resolution, multi-room music streamer and a digital amplifier capable of delivering a total of 300W of power. Naim didn't have anything new to show in Munich, but it did display the inside of one of its NAP 300 power amplifiers. It wasn't just about high-end hi-fi, Panasonic decided to show off one of its current 4K TVs. Pioneer teased a few details about two forthcoming products: the FS all-in-one AV system and the NC-50DB CD player and network streamer. To celebrate its 25th birthday, PMC launched a new range of Twenty5 speakers. They use a new vent design which borrows aerodynamic technology from F1 racing cars. Q Acoustics also had a new launch at the show. The Concept 500 floorstanders represent one of the most expensive pairs the company has produced to date. Of course, we just had to take another picture of the Technics SL-1200G turntable. We were treated to yet more turntables at the show, including this family of decks from Thorens. 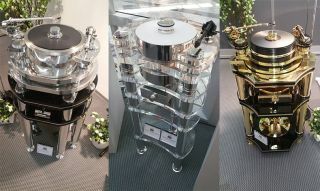 A trio of Transrotor turntables was displayed, with a combined value of nearly $500,000. Yet more high-end turntables, this time from Vyger and its Atlantis Generation IV deck. You can have one for around £30,000. A few horn speakers from Western Electric were on show, including the Sound System and the 11A Horn System, originally built in 1924. Pro-Ject was showing-off a new, transparent turntable, as well a selection of colourful decks to show the various finishes available. ELAC announced new speakers and turntables to celebrate the company's 90th anniversary, including this easy-on-the-eye Miracord 90 deck.